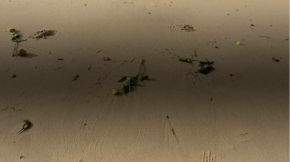 In a horizontal camera movement, the video reveals scattered roses on a sandy beach. Layered on top, a shadow-like horizontal bar irregularly increases and decreases its width, oscillating between a line and a plane. The soundtrack consists of succeeding chords, played by an ‘electronically prepared’, digital piano, generating a detuned sound sequence.